What did Krishna have in store for A. C. Bhaktivedanta Swami as he embarked, essentially penniless, on his voyage to America? I am victory and adventure. For thirty years, the Swami had attempted to launch his mission inside India but nothing had worked. Contracts for properties fell through, pleas for financing failed, letters to heads of state went unanswered. He had even walked the streets of Delhi with a self-published newspaper, approaching strangers seated at outdoor cafes and politely entreating them to purchase a copy. Here he was, finally on his way to America and maybe Sumati Morarjee was right. It was foolish for a man his age to pursue a dream with no money or contacts. He was a strict vegetarian. What would he eat? Winter was coming. How would he survive the cold? Teachers who had gone West before him, Swami Vivekananda, Paramhansa Yogananda, Rabindranath Tagore and others were all younger and more experienced travelers. Swamiji was about to turn sixty-nine and he had never been outside India. He had written to his middle son, Mathura Mohan, letting him know that he was at last leaving on his mission and asking for his help. He offered Mathura Mohan a monthly salary of 100 rupees if he would agree to oversee future printings of his books and magazines in India while he was in America. Mathura Mohan had not forgiven his father for renouncing their family. He refused the offer of employment and declined to show up at the pier when his father boarded the Jaladuta. The Swami placed a call to his youngest son, Vrindavan Chandra. Please come, he asked, and take me to the ship. Twenty-six-year-old Vrindavan Chandra arrived by taxi at the Scindia residences in North Calcutta around 5 a.m. on August 13, 1965. The Scindia freight office had taken responsibility for loading onto the Jaladuta 200 sets of the Swami’s three-volume Srimad Bhagavatam packed in metal trunks, and Vrindavan Chandra found that his father was not carrying much: a small suitcase, an umbrella, a trunk for personal items and a bag of dry cereal. If the West provided nothing acceptable to eat, he could soak the cereal in water and live on that. They loaded everything into the taxi and drove off. The Jaladuta’s gangplank was down, ready to receive its crew. 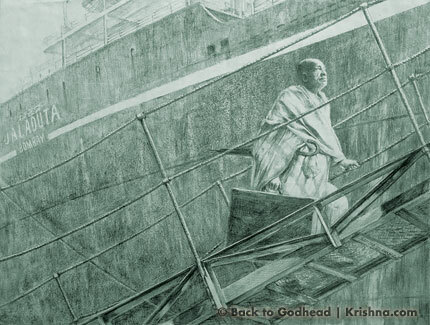 Bhaktivedanta embraced his son, turned and boarded the ship. The crew of the Jaladuta knew what lay ahead. They had made the crossing before and were prepared for violent storms and gale force winds. The trip across treacherous waters was scheduled to take more than a month. They had heard about their sole passenger and watched as the elderly sannyasi with his umbrella and sack of cereal walked up the gangplank, ready to chase an impossible dream. Yet weren’t all great journeys just that: impossible dreams? Climbing to the top of the world’s tallest mountain, diving in a tin bucket to the bottom of the ocean, riding a giant firecracker into outer space—was it so different to travel half-way round the globe through storms and blackness and nothing but a determination to respiritualize the human race? There were only two possible outcomes to such folly. He would do the impossible, or he would die trying. YOUNG KISHANLAL SHARMA grew up in Vrindavan. At age ten, his duties included caring for his father’s cows and delivering metal containers of fresh milk to village residents. 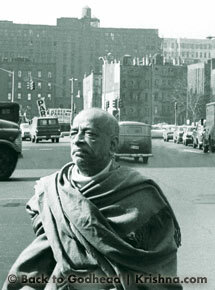 As a boy in the early 1960s, he watched Bhaktivedanta Swami go house to house begging alms. On days when the elder sadhu came to the Sharma home, dressed in his tattered dhoti and wearing dusty sandals on his feet, Swamiji held out a metal cup and Kishanlal’s father filled it with fresh milk. They spoke for some time, of the sad shape of the world, of how fortunate they were to live in Krishna’s land and of the Swami’s plans to share Krishna with the West. Mr. Sharma smiled indulgently, marveling at how consistently an old sadhu could nurse a dream. Sometimes Mr. Sharma sent his son, Kishanlal, to bring milk to Swamiji’s room in nearby Radha Damodar Temple. One day, with the metal container swinging back and forth on his handlebars, young Kishanlal biked to the temple but the gates to Swamiji’s rooms were locked. Kishanlal knocked on the door of the pujari, the temple priest. THE FIRST HEART ATTACK occurred just days after the Jaladuta left port. “The Sea Messenger” crossed the Bay of Bengal, sailed out into the Indian Ocean and from there into a foreboding Arabian Sea where high waves buffeted the 13,000-ton vessel. 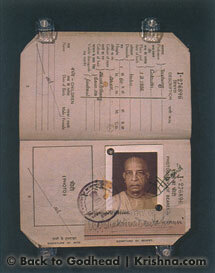 From the moment the Jaladuta left port, the Swami kept a diary. The entry on August 24 noted, “Rain, seasickness, dizziness, headache, no appetite, vomiting.” At the height of the storm, a jolt of pain exploded in his heart and his legs gave way. He staggered back to his bunk where he collapsed, shivering with fever. He put his right hand in a cloth bag that held his prayer beads and turned the wooden beads between first and third fingers, reciting the Krishna mantra, “Hare Krishna, Hare Krishna, Krishna Krishna, Hare Hare, Hare Rama, Hare Rama, Rama Rama, Hare Hare.” A second heart attack struck three days later. The pages of his diary for the following week were blank. He went without food and had no energy to write. 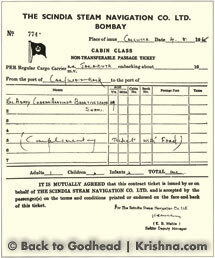 Darkness at sea brought a brittle cold and the Swami wrapped himself in a regulation steamship company blanket. When the pain in his chest finally began to abate, he slept. In his diary, he wrote that Krishna appeared in a dream, rowing him in a boat toward a distant shore. Over the next week, the storm dissipated. Sunlight emerged from behind dark clouds and the waters calmed. The Jaladuta steamed into the Atlantic Ocean under clear skies and a crisp breeze. On August 31, the Swami wrote in his diary, “Passed over a great crisis in the struggle for life and death.” This was hurricane season, yet there were no waves. The Atlantic was smooth as glass, placid as a lake. The crew whispered. Their passenger was no ordinary sadhu. “This kind of quiet Atlantic I’ve never seen in my life,” the Jaladuta’s captain marveled. “It is only by Krishna’s mercy,” the Swami told him, thinking that if there had been a third attack he would surely have died. There was no choice now but to continue on to whatever Krishna had in store. His guru had inspired him to become a warrior like Arjuna, the hero of India’s sacred text Bhagavad Gita. If he was going to die, better to die on the battlefield. So he reached into his small battered suitcase and pulled out an edge-worn copy of Chaitanya Charitamrita, the seventeenth-century biography of Chaitanya Mahaprabhu, the avatar who had sung the sacred names of Krishna in the streets of Bengal. Mahaprabhu predicted that one day the names of Krishna would be sung around the world. 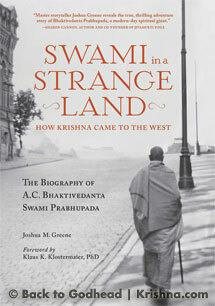 A.C. Bhaktivedanta Swami passed his remaining days at sea meditating on a prediction he hoped to make come true. The following day the ship departed for New York. At noon on Sunday, September 19, 1965, Swamiji stared out at skyscrapers lining the New York horizon like giant concrete teeth. From his bag, he chose a dhoti—a three-yard length of cotton cloth dyed saffron, the color of a Vaishnava monk—and put on white rubber shoes and dressed with care. He said goodbye to the captain and crew and thanked them for their hospitality. Then he arranged for the two hundred sets of his books to be stored in the Scindia warehouse. If somehow he were able to sell a few copies, he would use the money to cover expenses for however long he stayed in America. Then, with nothing but his tiny suitcase, bag of cereal and an umbrella tucked under his arm, and holding the railing as firmly as his recovering muscles would allow, he stepped off the Jaladuta and into the future. THE AGARWALS HAD ARRANGED for a representative from Traveler’s Aid to meet the Swami on his arrival, and together with the agent he set out for Port Authority Bus Terminal. The Swami had sold a set of his books for twenty dollars to the Jaladuta’s captain, enough to purchase a ticket for Butler, Pennsylvania, where the Agarwals lived with their infant son. Along with a letter of sponsorship, the Agarwals had extended an invitation to stay for a few weeks in their Pennsylvania home as a way of adjusting to life in America. On the bus, the Swami watched an endless stream of cars fill the highways exiting New York City. He traveled past skyscrapers and slums, past billboards and blackened industrial zones and miles of factories that lay between New York and Pennsylvania. America’s four-hundred-year history revealed itself to him with every passing mile. Pioneers had made their way across the Atlantic seeking religious freedom in a land of their own. They crafted homes of wood cut and carved with their own hands, plowed the earth, offered prayers of thanks and built a nation like none other in human history. Generations came and went, and their descendants swapped their ancestors’ noble purpose for the chance to bore through mountains and urbanize vast tracts of land. They spent fabulous sums constructing coast-to-coast highways, soaring skyscrapers and dense cities that concentrated millions of people into vertical mazes of concrete and glass. Inspired by advances in technology, they evolved a new ethos. Americans were no longer caretakers of the earth but its masters, competing with one another for profits and goods. They turned their backs on covenants with the natural world, gouged the ground for oil, pillaged forests, built slaughterhouses, churned out weapons, conquered foreign lands and made of the world one huge market. Money was their God—the same one India now worshiped. The Swami looked at the vista of this strange land whizzing past his window and knew there would be a reckoning. Once the Americans exhausted their fantasies about finding contentment in material things, they would emerge from their offices, clubs, shopping malls and restaurants and wonder what went wrong. When the veil of illusion fell away, when the reality of old age and disease and the sad brevity of a lifetime at last penetrated, the meagerness of their lives would become clear—and that would be the moment for Krishna consciousness, the lifeline that could save them from drowning in an ocean of repeated births and deaths. He had come for this purpose, to make the message available. Wake up, the Vedas declared. Don’t remain in darkness. Come up to the light!